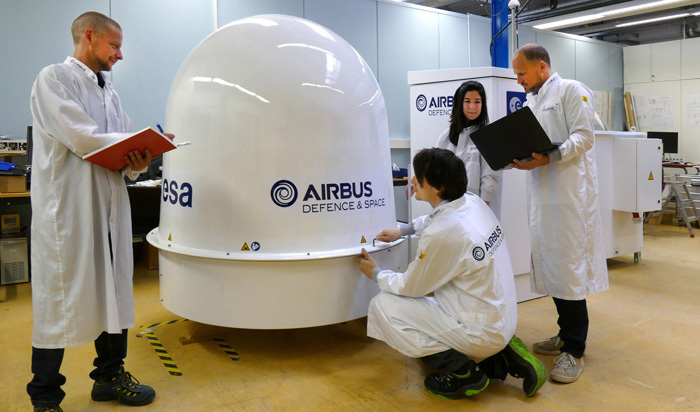 November 16, 2015 – Airbus Defence and Space has delivered the first ACES Ground Terminal to the German National Metrology Institute (Physikalisch Technische Bundesanstalt, PTB) in Braunschweig, Germany. All around the world scientists are getting ready to challenge what is known today about time and space. A rigorous test of Einstein’s theory of relativity is the aim of the Atomic Clock Ensemble in Space (ACES), developed by Airbus Defence and Space for the European Space Agency ESA. Airbus Defence and Space will deliver nine Ground Terminals needed to compare ultra-accurate atomic clocks to the ACES “super clock” that will orbit Earth on the International Space Station. Several times a day the ISS appears over the horizon, and the Ground Terminals then autonomously track the Space Station and compare the ACES clock ensemble to the ground atomic clocks in the institutes. The first Ground Terminal is now been readied for installation at PTB in Braunschweig. It will be followed by similar units installed in France, the UK, Japan, and the USA. Linking atomic clocks around the world via microwave and optical links will allow scientists to see the effects of gravity on time and deliver precise timekeeping. Delivering a performance equivalent to losing only one second every 300 million years, ACES will help scientists carry out research into such exotic phenomena as relativistic time shifts and drifts of the fundamental constants defining the Universe. This type of precision timekeeping is also critical for GPS, which has become a vital part of transportation, cargo, and banking transactions. The mission will start with the launch of the ACES clock ensemble scheduled for Spring 2017.